My daughter’s cancer diagnosis put a halt to completing the Yeti BBQ Passport and now all the big prizes are gone. While it is disappointing that there is no prize at the end, I still plan to do all 50 before the next list comes out.  Since there is no longer a rush to be one of the first 500 folks to complete the challenge it has given me more incentive to visit BBQ joints not on the list. Last weekend I took the opportunity to visit Panther City BBQ in Fort Worth Texas. Located in the old Heim BBQ trailer location, I was already familiar with the location and I always loved the setup. I arrived about 11 AM and was 5th in line! Within 10 minutes I was ordering my food. I got brisket, ribs, and sausage as well as a side of chopped brisket helotes. 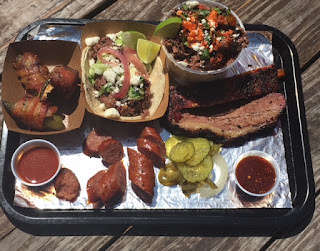 Panther City not only has the traditional BBQ favorites, they also have brisket tacos and pork belly jalapeno poppers, so I added that to my order as well. My love for tacos took over and that’s what I went with first. The taco was on corn tortillas, piled high with brisket, pickled onions, and cojita cheese. At $3 a piece this could be a meal all alone, add another and you’ll be looking for a place to take a nap. After the taco I grabbed a bite of the brisket helotes. Creamy and salty, it too is a very filling dish. While it was good, I didn’t eat much more so I could tackle the other food. Next up was the pork belly jalapeno poppers. The pork belly was a little dry, but with the flavorful peppers and bacon it was still fantastic. I loved the fact that the peppers had great flavor with minimal heat. The brisket was perfectly smoked, traditional hill country salt and pepper with a light smoke flavor. It was very good brisket, but not much different than what you find at a lot of joints these days. The ribs were fantastic with the perfect balance of sweet and heat and my favorite of the trinity. Finally the sausage had a good snap, with a small kick of heat that wasn’t over powering. I loved it and would love to see that in a tortilla someday. I love this place! I can’t wait to go back and just gorge myself on jalapeno poppers and brisket tacos and maybe a few beers at Republic Bar next door.